One of the most buzzed-about films of next year is M. Night Shyamalan’s Glass, and for good reason. The January 2019 release marks the end of Shyamalan’s trilogy which also includes Unbreakable and Split. Part of the excitement is due to the fact that no one expected a trilogy. Fans have long wanted a sequel to Unbreakable, which opened in 2000. When his film Split arrived in 2016, it was only after release that we realized it was set in the same world as Unbreakable, setting the stage for a third film. 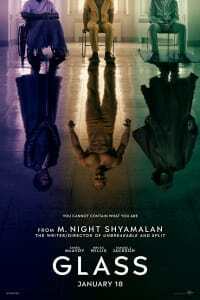 The third movie, Glass, brings together key characters and elements from the previous movies. It expands the universe and ups the stakes set in previous movies. Three men with extraordinary abilities are at the center of the story, and despite shades of horror and thrillers, this is very much a superhero film. 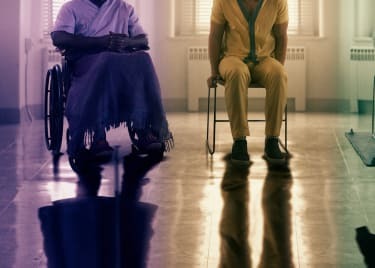 Here’s why Glass is certain to be Shyamalan’s biggest movie to date. M. Night Shyamalan turned heads with The Sixth Sense in 1999. While his follow-up, Unbreakable, was a smaller film, it quickly earned a major cult following. Bruce Willis plays David Dunn, a security guard who discovers he has superhuman abilities after surviving a train crash, and Samuel L. Jackson as the physically fragile but mentally awesome Mr. Glass. The film approaches comic books in a meta storytelling fashion, and Unbreakable stands as one of the more unusual and idiosyncratic superhero movies. Shyamalan always intended to write a sequel to Unbreakable. Lack of studio support kept the idea on the back burner for almost two decades. Then came 2016’s Split, starring James McAvoy as Kevin Crumb, a mentally ill man whose psyche is fractured into 23 different personalities. The character was written for Unbreakable, but Shyamalan cut him because of time constraints. The idea for the character stuck around, however, eventually spawning Split. In Split‘s final major twist, Bruce Willis appears in a cameo as David Dunn. That connected Unbreakable and Split, and the fate of McAvoy’s character laid down the tracks for Glass. Now, after nearly two decades, Shyamalan finally gets to complete his superhuman saga in the way he intended. Fans got a quick glimpse of Willis in Split, but fans were eager to see the return of Samuel L. Jackson’s Mr. Glass. The complex villain makes his glorious return in film’s first trailer. 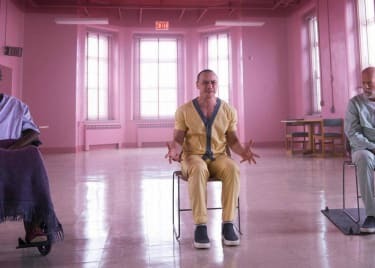 Even better, the footage teases a team-up between Mr. Glass and Crumb’s violent personality, “The Beast.” Clearly, David Dunn is involved with those two men, considering the trailer shows the three of them in a mental health facility. But that’s only part of the story. Glass will also see the return of characters from Unbreakable and Split, such as Joseph Dunn (Spencer Treat Clark), Mrs. Price (Charlayne Woodard), and Casey Cooke (Anya Taylor-Joy). Sarah Paulson has a major role as a new character, Dr. Ellie Staple, a psychiatrist who specializes in patients who think they have superhuman abilities. Shyamalan has a history of working with actors on multiple projects. The fact that big names are willing to return to work with him says a lot about him as a director. 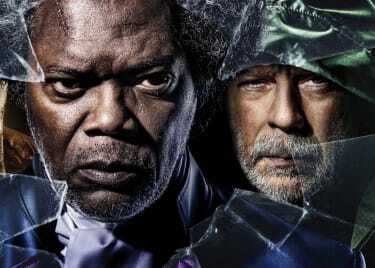 Willis and Jackson didn’t think twice about reprising their Unbreakable roles for Glass. For years, they claimed to be hounding Shyamalan about making a sequel. It’s now time to finally bring these characters back to life for the big screen. The primary thrust of Glass will focus on David Dunn’s fight to bring down Kevin Crumb’s Beast personality as Mr. Glass orchestrates Crumb’s villainous actions. That gives the trilogy a broader scope that looks closely at how we see superhuman heroes and villains, and how they see themselves. It’s the sort of approach projects like Watchmen and The Dark Knight were renowned for adopting. Now that superhero movies are a major source of entertainment, we’re eager to see how Shyamalan breaks down their tropes and structure after all these years. The superhuman characters at the center of Shyamalan’s movies might be different than those in typical superhero films, but that is a major part of the draw for fans of the genre. We don’t often get to see a master filmmaker put his own stamp on something so familiar, and we’re eager to see the twists and surprises in Glass.